The project DINGWELT (i.e. thing world) of the German artists Petra Müller and Michelle Adolfs, KUNSTKOMMT!, has made possible to participate in an art action via an online exchange market for things with history. During the exchange process of one year (2003/15/09 - 2004/15/09) we have been collecting personal used things with history and giving art printings with certificate to each participant. This COLLECTION shows all exchanged items and builds together with the 12 art printings of the process the DINGWELT installation. The idea of the action is simple: Exchange a thing with a story for a printed art work with a represented thing. DINGWELT collected small and big things with a hand written story of their owners and staged them. But where do the borders of the virtual exchange activity and the determined value for things lie when the material disappears? How do things obtain their value, perhaps by the exchange process itself? Do we increase the value and the relationship of the thing with its story in digital space as currency for art? And are there values which are universal common by the contributions to the DINGWELT exchange market? 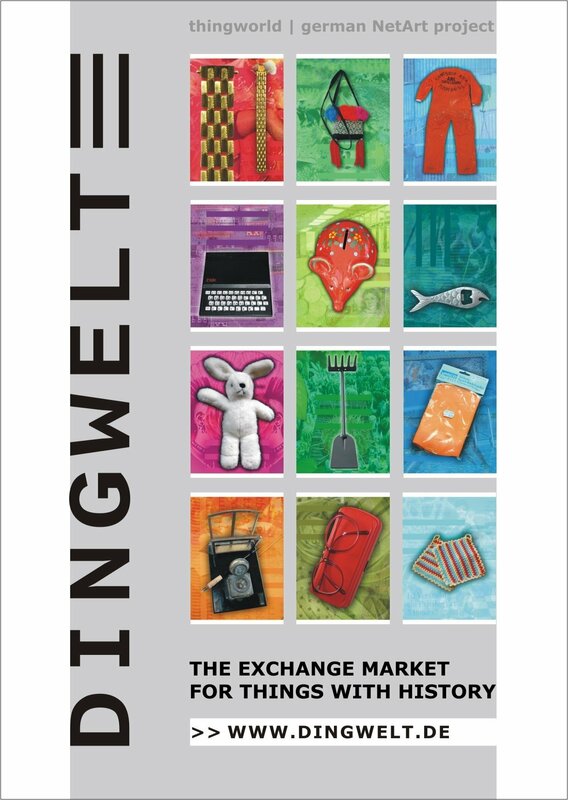 The DINGWELT exchange market deals with goods relations and value determinations of used things. It argues with the influence of new media on the consumer culture and offers a reflection: in a culture of the "NEW" with used things and in a culture of disappearing material in cyberspace with real material. The collection was growing during the process. In the documentation the individual present relations and the processes of imagination survive. A conscious participation and the narrative production of meaning is provoked. The social, symbolic and aesthetic concepts of things with their form of poetic writing become the focus of intention, while the function and the material construction of things form the background. The DINGWELT project is now a hybrid net art installation in both hyper and physical space. The installation shows the whole catalogue of the printings offered for exchange (12 collages/ 12 stories) together with this online documentation of the exchange process. This presentation shows digital items as real looking objects in top view on platforms in the shape of the DINGWELT-logo and it stresses the experience of both spaces in this way. An environment is created which is challenging and can be perceived also with fun. For participating in the exchange process, there were some rules as framework. What was ok and what was not ok. . .
06.10.04 | Oslo, Norway "wheel of life"
21.09.04 | Berlin, Germany "art mail"
26.08.04 | Latina, Italy "airmail"
10.08.04 | Massa Lubrense, Italy "digital images"
21.06.04 | Veenhuizen, Netherlands "postcard"
18.06.04 | New York, USA "smell object"
18.06.04 | Latina, Italy "mirror object"
11.06.04 | Palkäne, Finland "artmail"
09.06.04 | Grandfresnoy, France "art project"
29.04.04 | Ravenna, Italy "StraDADA"
29.04.04 | Morigudin-City, Japan "brain cell 572"
13.04.04 | Ontario, Canada "poem for peace"
26.03.04 | Oberlin, USA "pretzel picture"
30.01.04 | Salzburg, Austria "post-it"
The development of the project DINGWELT exchange market began on 15th of September 2002. We started creating the website in April 2003 and set up the project on 15th of September 2003. Then the art action was realised for one year. All work (digital collages, website and action) has been done independently by the KUNSTKOMMT! team. an inspired participation of the economical and cultural community. Thanks! COLLECTION area (based on oracle) during the exchange time.